Traditionally, concrete floors have been used for the exterior of a building, like a garage or a driveway. It has even been used in an interior basement, only to be covered in most cases by a wall-to-wall carpet. And that is why it is such a design moment when this material is proudly used to show off your interior. Concrete is hardly the (dull) grey, unpolished and abrasive surface you visualize when you think of conventional concrete floors. Instead ladies and gentlemen, let us introduce you to polished concrete, making an exotic comeback this century. In this blog, we tell you more about this kind of flooring and the maintenance and care required to keep it shining beautifully for years. The aggregate can be a diverse mixture made of sand, gravel, rocks, crushed stones, river stones and even granite chips. (It is this diversity that is now being tapped to create designer polished concrete.) As you can guess, the aggregate forms the bulk of the concrete (up to 80%) and gives it its indomitable strength (especially useful for building skyscrapers). The cement and water paste not only form a glue to hold it all together but also serve as the outer coat. It is for this reason cement is often mistaken for concrete when the former is only a part of the latter. 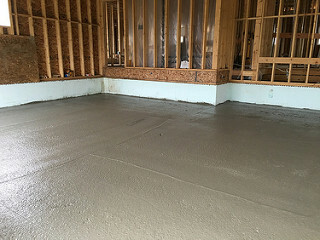 At this point, you may assume that a lot of cement paste would be required, to cover the coarseness of the main aggregate, especially if it to be used as a decorative concrete floor. But this is not the case, and that will become clear as we go through the steps required to lay a beautiful, polished concrete floor. This is the most intensive part of the job and hence requires both skill and experience. Here, the coarse concrete is first smoothed into a more even surface, filling empty pores with densifier so the strength is not compromised. This mixture is then dried and ground until it becomes the fine, decorative finish you desire. The higher the quality of the finish, the more it will shine after polish. Next, the floor itself needs to be prepared before laying out the concrete mixture. For this, it is stripped of existing flooring and then thoroughly cleaned and treated, until the floor is even. It is then covered by two layers of sand + plastic sheet, which make it moisture resistant. A final layer of mesh wire sits on top to form the base of the concrete floor. The treated concrete mixture is then poured on the wire mesh and leveled using a float. Again, precision is required so the floor is even at all places. Once this process is done, it left to dry for up to 3 days. Remember how we said concrete floors are no longer just plain grey? Here is where the color comes in by applying a coat of epoxy paint or wood stain. This gives best results for new, uncolored floors, as old floors that have been previously colored may not take on an even finish. 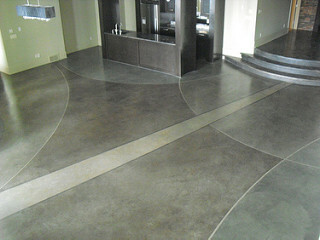 Now this is the step that turns your ordinary concrete floor into a designer piece! This is also a job strictly for a professional because of the level of skill required for the job. Here, a planetary grinder is used to polish the entire floor. This final step is in fact the most important part as it literally seals the final finish. Hence extra care is taken to first seal the entire area so no dust, pests, rodents or even insects can enter. 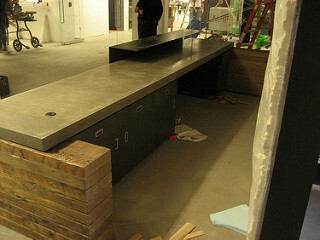 A final clean-up is done before the sealer is carefully sprayed on to the polished concrete to craft an even surface. 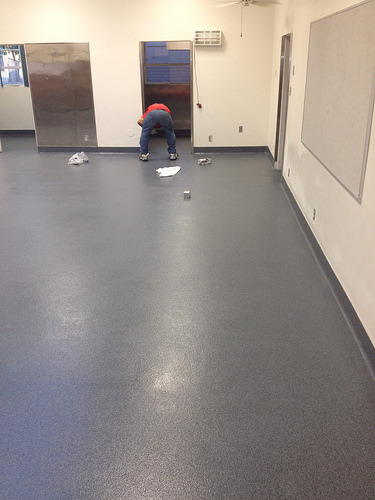 A floor polisher gives the final touch. After this, it is left undisturbed for at least a couple of hours before use. Do you know a professionally laid concrete floor can comfortably last for a minimum of 10-15 solid years! If that isn’t good enough for you, let us revisit what you are getting: an immensely durable floor at a throwaway price. The price is approximately doubled when you add radiant floor heating, still very affordable for luxury heated polished concrete. You can further extend its lifespan if you protect it in high-traffic areas by throwing on a dense rug or two. This can not only elevate the décor but also dramatically reduce the possibility of stains or cracks to your polished floor. This will also protect it from material accidents. You should know that concrete doesn’t offer as much ‘give’ as other floors, so if anything remotely fragile falls on it, it is likely to break. Now imagine that you put just a little more effort into the regular care of your floor. We are taking of 3 kinds here: the daily kind, to ensure it is clean and smooth; the on-need kind, when you spot a stain or a crack which can spoil the floor; and the yearly kind, to buff up its shine. With this kind of care, you can easily double its lifespan. Now this is a mighty big value for a small investment that is likely to last almost a lifetime! The level of maintenance your concrete floor needs may vary in degree, depending on whether it is (additionally) polished or stained. Here are the general guidelines. It all starts with a good broom around your entire floor. If it is polished concrete, prefer a dry mop with a micro-fiber pad, to avoid ruining the effects of the polish with abrasion. Next, follow up with a good (micro-fiber) mopping. 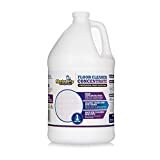 Here, make sure to check with the floor installer on the kind of cleaning material you can use (like a good ammonia-free, bleach-free, pH-neutral detergent). This is especially important for colored concrete as you don’t want to wipe out the paint/ stain color inadvertently. If your concrete floor is unpolished and in an exterior area (like a garage), you should also consider a weekly power wash for cleaning so no grime permanently settles into your floor. 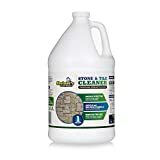 Any time you notice a spill on your concrete, check with your installer on the kind of cleaning solution you can use, to wipe it away immediately. Else, the spill will get absorbed really quickly and ruin your overall finish. A crack on the other hand needs a more robust fix but is to be acted on just as quickly. A delay in fixing this can compromise the structural integrity of the concrete floor and allow water to seep through. In turn, this will cause the concrete floor to shrink and significantly reduce its lifespan. It is for this reason that we strongly recommend calling in the professionals. Depending on the size and depth of the crack, they can decide if it can be dealt with using merely a polymer-filling or an additional joint filler. In severe cases, it may even need to be resurfaced and polished (optionally stained) to restore the original decorative finish. 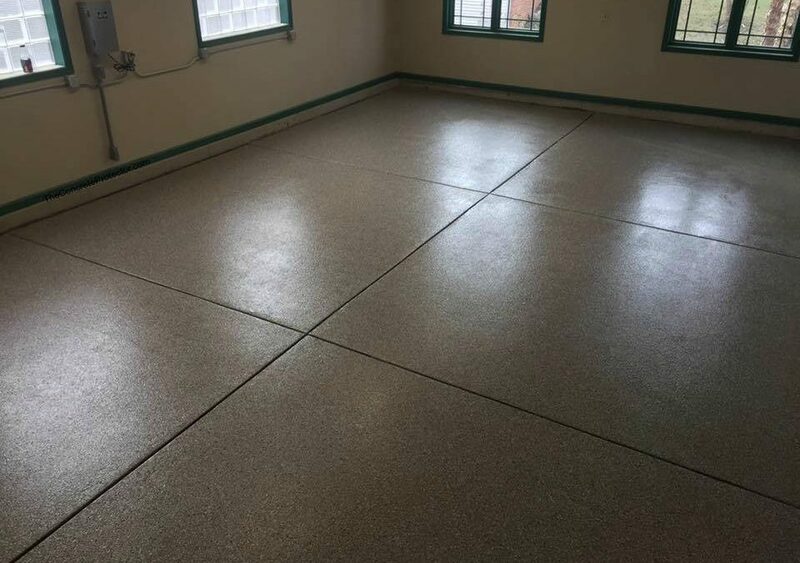 Once you get used to polished concrete, you notice that besides the daily clean, they do not need all that much maintenance. So no scrubbing, no waxing, no buffing, etc. However, manufacturers do recommend that you renew the state of your entire floor every 2 years through a professional re-polish/sealing. If this is not done, it can transform with time into its poorer cousin: dull grey, unpolished and abrasive. And after being used to its prettier state for so long, this is one transformation you do not want to allow! In summary, Concrete floors have always provided home owners with the value for money. But until a few years ago, they were relegated to the exterior, or hidden areas of the property. It was not until about a few years ago that this style of flooring got a decorative shot in the arm with polished concrete. Manufacturers are also constantly experimenting with styles, shapes and colors, so this is one type of flooring that is definitely worth investing for the future. On a final note, we will remind you that while the whole process of laying the floor can take less than a week, it is still extremely time-sensitive with a need for both skill and experience. And that is why this decorative floor, no matter the cost, should never be considered as a do-it-yourself project.